Happy student with a money at the school desk on the white background. Photo courtesy of Shutterstock. 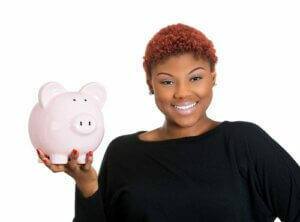 Students need to be their own personal financial managers. They also need to be financial planners, looking at future expenses. How can you survive the money pit of college? By planning and managing your money vigilantly. Avoiding overspending and accumulating high credit card balances are important goals for success. 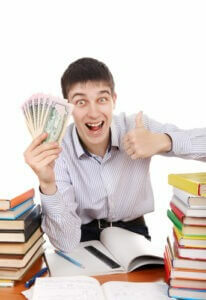 One of the first major expenses is textbooks. You can save significantly by renting your books. Many students buy used books and materials. Make sure that any interactive materials, such as CDs, website codes, and more, are transferable. Some students share books, especially when they have different class periods. Graduation: Student excited about diploma and graduating. Photo courtesy of Shutterstock. So you raced through the last four years—acing tests, tackling internships, and having some fun along the way. It was all for this moment, now you proudly hold your college diploma in your hands. Go ahead and celebrate, you deserve it! But when you wake up tomorrow, will you know what you’re going to do with your life? There can be some tough situations after college for which you may not be prepared. But that’s okay, you’ll get there. Closeup portrait of young woman holding her piggy bank friend in hand, isolate on white background. Positive emotion facial expression feelings. Smart wise saving paid financial decisions. Photo courtesy of Shutterstock. College student holding money and books, upset by tuition cost and debt. Photo courtesy of Shutterstock. If you are a college freshman who wants to make the most of your financial situation, be sure to avoid the 15 mistakes mentioned by Kiplinger in the following post. · Spending without a budget—students might not have much experience tracking their spending, but their checking account balance could quickly hit $0 if they don’t take the time to find out where their money is going on a day-to-day basis. College student with tablet and backpack. Photo courtesy of Shutterstock.